Coming out soon is the 8th volume of Straight Arrow's "From The Booth tapes“ series. 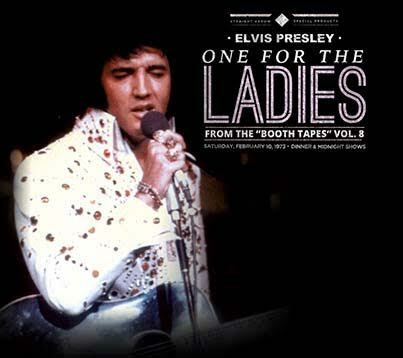 It's 2xCD entitled "One For The Ladies" featuring Elvis' Dinner and Midnight show from February 10th 1973. These recordings are taken directly from original 'booth recorded' mastertapes. Both these concerts showcase Elvis in fine form. It was a busy month, with many highs and lows, but thanks to the outstanding success of the ‘Aloha’ special, Elvis' reputation as the ultimate superstar was now firmly cemented. There were a few off-nights due to Elvis having the flu, but he was certainly in good spirits at these two concerts, and he delivered the goods to two packed showrooms. These excellent sound booth recordings capture the excitement of these shows beautifully. The Dinner show is previously unreleased, except for portions of an incomplete soundboard recording with a bass-heavy mix and Elvis' voice in the background (CDs ""Echoes Of Aloha" and "Aloha, Jerry! ", both on the Audionics label in 2013). The Midnight show has been previously released on CD ("I'd Like You To Meet Jack Lord" on the Crown label in 2002, and the slightly improved "Turning Up The Heat In Las Vegas" on Memory Records in 2003). However, these older CDs have nothing to do with this Straight Arrow’s excellent "booth tape“ version. Ask your dealer for sound samples. 01. Introduction: Also Sprach Zarathustra - 02. C. C. Rider - 03. I Got A Woman / Amen - 04. Love Me Tender - 05. You Don't Have To Say You Love Me - 06. Steamroller Blues - 07. You Gave Me A Mountain - 08. Fever - 09. Love Me - 10. Blue Suede Shoes - 11. Heartbreak Hotel - 12. Johnny B. Goode - 13. Hound Dog - 14. What Now My Love - 15. Suspicious Minds - 16. Introductions of singers, musicians, orchestra - 17. I’ll Remember You (dedicated to Jack Lord) - 18. I Can’t Stop Loving You - 19. An American Trilogy - 20. Can't Help Falling In Love - 21. Closing Vamp / Announcements / Comments by fans. 01. Introduction: Also Sprach Zarathustra - 02. C. C. Rider - 03. I Got A Woman / Amen - 04. Love Me Tender - 05. You Don't Have To Say You Love Me - 06. Steamroller Blues - 07. You Gave Me A Mountain - 08. Fever - 09. Love Me - 10. Blue Suede Shoes -11. Heartbreak Hotel - 12. Johnny B. Goode - 13. Hound Dog - 14. What Now My Love - 15. Suspicious Minds - 16. Introductions of singers, musicians, orchestra - 17. Introduction of boxer Jerry Quarry & actor Jack Lord / Hawaii 5-0 theme - 18. I’ll Remember You (false start only) / I Can’t Stop Loving You (with false start & reprise) - 19. An American Trilogy - 20. Can't Help Falling In Love - 21. Closing Vamp / Announcements. ← Holding His Own In Tahoe! So, what's with the name "from the booth tapes". I mean, really. it's just an recording from the audience right?